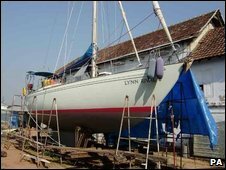 A yacht belonging to a British couple kidnapped by Somali pirates has been returned to the UK onboard the Royal Navy ship that witnessed their ordeal. 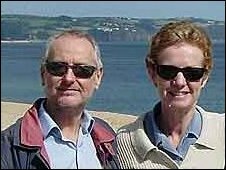 Paul and Rachel Chandler, 59 and 55, from Tunbridge Wells, Kent, disappeared on 23 October in the Indian Ocean. The yacht arrived at Portland, Dorset, onboard the Royal Fleet Auxiliary (RFA) Wave Knight on Thursday. It comes as the head of the Royal Navy hit back at criticism of his sailors' attempts to rescue the Chandlers. The RFA Wave Knight was alongside when they were kidnapped but the crew had not wanted to endanger the couple. A RFA spokeswoman said the Wave Knight, with the the 38ft Lynn Rival yacht onboard, had "returned to Portland as part of a planned annual rotation, which was a long-standing arrangement". The Foreign and Commonwealth Office (FCO) said it would probably be for the couple's family to decide and arrange what happened next to the boat. Meanwhile First Sea Lord Admiral Sir Mark Stanhope said reports the Navy did not do enough did a "disservice to our sailors", during a key note speech on his vision for the future of the armed forces on Friday. He said his team had done a "tremendous job" in its attempts to secure the couple's safety. Last week, the Chandlers spoke on camera for the first time to warn that their captors were "losing patience" and could kill them within a week. Their family made another appeal for their release after seeing the footage of them surrounded by gunmen. After the footage was aired, the FCO issued a statement expressing sympathy for the victims' families, but reiterating its position that it did not "make substantive concessions to hostage takers, including ransoms".